So, today we started using these great veggies. Julianne found a recipe for Cauliflower Alfredo sauce. Instead of butter, she cooked the cauliflower in no-chicken vegetable broth the stuck it in a blender with a bit of red miso. 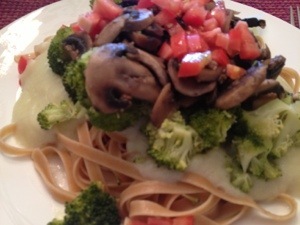 We put it on top of whole wheat fettuccine and topped it off with steamed broccoli, mushrooms sautéed in broth and garlic and then fresh tomatoes. 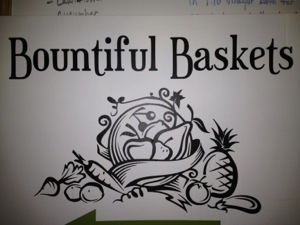 Everything but the noodles came from Bountiful Baskets yesterday. It was marvelous!! Amazing food and healthy food! !